I seem to be collecting photographs of finished items but just not blogging about them.Â Mostly because they just don’t seem to fit any one post particularly well.Â Plus, when my home life gets busy, my blogging takes a bit of a back seat.Â Suffice it to say that life seems to have sped up to hurricane force now that the girls are in school.Â We’ve got piano lesson one night a week, a garage sale to get ready for (yep, it’s round 2 for the summer since the last one was a dud) and a house that seems to dirty itself.Â Seriously, do the dirty socks grow on my living room floor?? ?Â Why is it that we have an automatic dish washer and an automatic laundry washer, but not an automatic putter-awayer of any sort?Â I know my trials and tribulations are no different than any other working parent.Â And I also know that I am lucky to have a husband who helps out.Â So why is it completely overwhelming at times? Enough whining.Â Here’s a bit of a random assortment of finished items. 1.Â Cruiser Mittens.Â Made from Misti Alpaca Sport weight and Rowan Kidsilk Haze held together on size 3 needles.Â I do these on 9″ circular needles because I don’t like switching needles all the time, that’s just how I roll.Â The combination of alpaca and Kidsilk Haze is wonderfully soft.Â The photo is of the unblocked mittens, I wasn’t in a rush to block them because they’reÂ a Christmas present.Â As I was working on these I realized that with just a simple heel added in, the pattern would make amazing socks.Â I even have more Misti Alpaca to do this with.Â Â Hee hee. 2.Â Basic Lined Mitten.Â Made with Malabrigo Twist on the outside and Berrocco Ultra Alpaca Light for the lining.Â These are the mittens I made for a friend in trade for doing some minor body work on my car.Â He’s been hinting that he’d like a matching hat for Christmas.Â I finished the mittens right after the Finish-a-long challenge ended so I couldn’t count them in my total. 3.Â Sweet Norwegian Baby Cap (not the original pattern, but there’s a link to the English version and sweet photos) out of leftover sock yarn.Â You might notice this is the same yarn that made a pair of socks last year for my sister and the troll vest.Â I bought this yarn at a fiber festival and promptly lost the sellers tag.Â I wish I knew where I bought the yarn because it is lovely stuff.Â It also seems to be a bit of a never ending skein since I still have a tiny bit left. Now, I’m off to indulge in a bit of startitis. They are my favorite socks too! I only wear them to watch tv, study, and shovel snow! I’m afraid I will never get another pair!!! I had them on last night in fact! 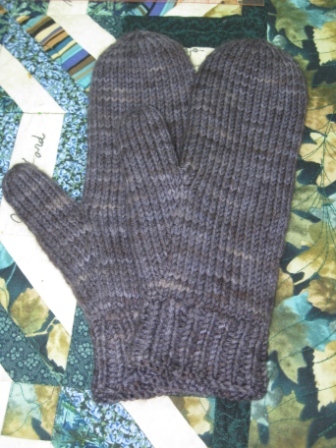 I’m working on some lined gloves now – how did you do the cuff of the lining? I can’t decide if stockinette, 1×1 or 2×2 ribbing would work best. The lining and outer layer are different yarn weights, adding to the complications. I didn’t line the cuff. I picked up stitches at the beginning of the body of the mitten and knit from there out. I did the liner mitten in sport weight yarn on size 6 in stockinette. 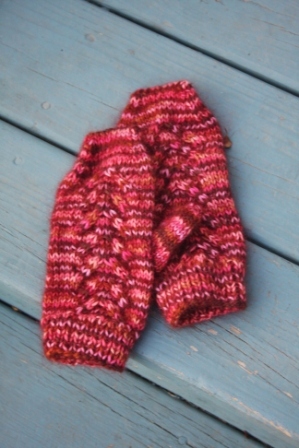 As for the cuff, I’d say swatch it and see if you like 1×1 or 2×2 ribbing best. 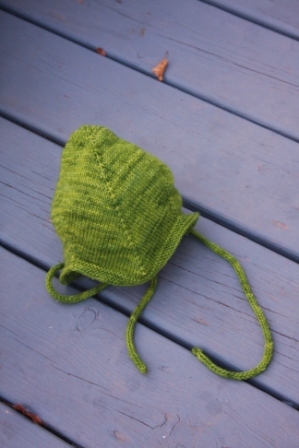 I’m looking for the pattern tonight, I know its a free one from Ravelry. Great projects! I especially love the little baby hat 🙂 That yarn is lovely! Huh, I’ve got startitis too. But it’s taking all my will-power to not indulge the urge. I’ve got things to post about too, but unlike you, no pictures just waiting around to go with my posts. Guess I’d better get snapping. Hope things slow down soon! Previous Previous post: Well Dressed Troll? Next Next post: Start Your Engines!